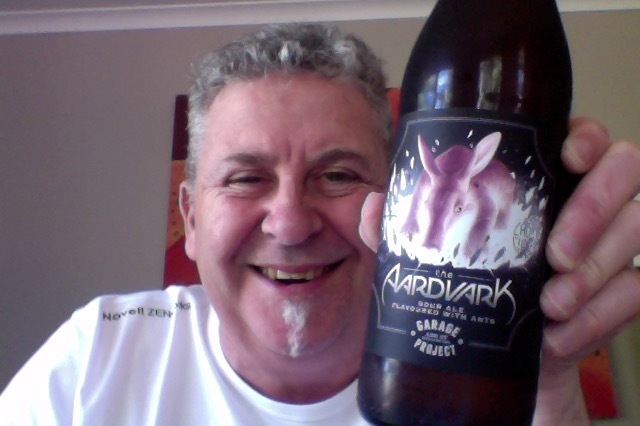 The Aardvark, which is all intriguing, isn’t it. Not the prettiest of animals. Then you read the blurb “Flavoured with Lemongrass Ants” and then I’m thinking what could possibly go wrong! and I found the perfect album. This is a 650ml bottle of a beer that is 4% ABV, with 120 calories a serve, this bottle is 2.1 drink units. Consider the Aardvark (Orycteropus afer), a specimen whose visage seems to defy the very laws of nature and whose insatiable appetite for ants is legendary. Contained within this bottle is beer unlike any you’ve tried before. Flavoured with Lemongrass Ants the result is a startling citrus sour, to our knowledge unique in the world of brewing. Truly a treat for the brave soul with an enquiring mind and curious nature. On opening you get that Sour aroma, but this one seems to have an edge of something, unless I’m in full panic. This is one of those intensely dry and sherbet like sour beers. Sharp and intense burying everything underneath it, except for a lemony tang at the end there. Just another sour beer for me, and one that ends up not on the right side of the ‘Do I like Sour Beers’ question. I don’t like the dry sherbet sourness. The pdubyah-o-meter rates this as 7 of its things from the thing. It’s not my thing, this version of a sour beer, and it’s one that goes on the no side of the ledger. An interesting path to a sour beer, using ants that is, they’ve got great idea and some decent researchers to get to this. Glad I had it, disappointed it wasn’t nearer my taste. Where did I get it? Liquorland Forrest Hill had some. Would I have another? Not for me. Would I share with a friend on a porch and set the world to rights? I’d share the story but I don’t think I could share the beer, it’s not to my taste and I don’t think I could persuade you that it’s to yours either. Music for this: It is a sunday, a Vinyl Sunday, and I’ve got Scary Monsters by David Bowie on the Spotify player if you want to sing along. Scary Monsters (And Super Creeps), also known simply as Scary Monsters, is the fourteenth studio album by David Bowie. You’re getting close to 1,000. Hope you got something special planned for that one. Maybe a Coors or Fosters or Heineken? Bud’s the beer for me …. There you go … no more deserving beer for your 1,000th. And I did not actually just say that. If you quote me, I’ll deny it. It’ll be a great beer, the best beer…. 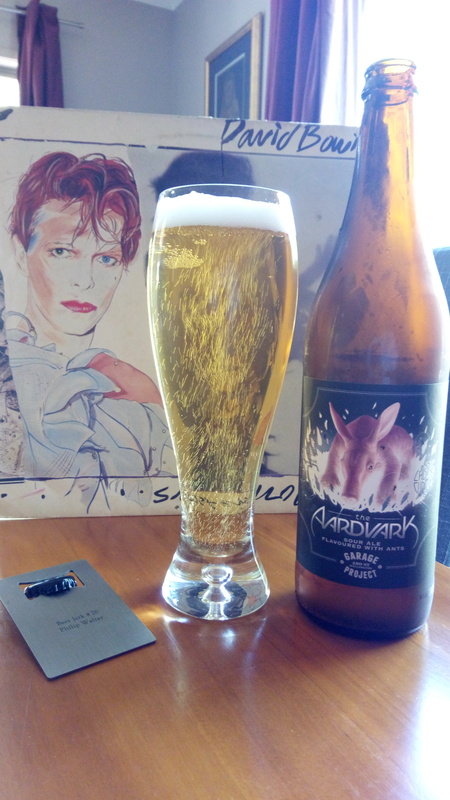 This entry was posted on November 12, 2017 by Philip Walter in Beer, Beer of New Zealand, Beer Review, Craft Beer, Critic, Garage Project, Sour/Wild Ale and tagged craft beer, Garage Project, Garage Project The Aardvark, Sour beer style.